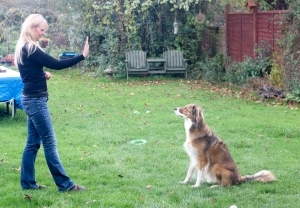 The stay command should be tackled after your dog has mastered and responds well to the come and sit commands. It is regarded as one of the most important commands and absolutely neccesary for a dog to learn. You need to clearly differentiate between the stay and wait command, something that confused me when I was training my first puppy. Stay means exactly that, your dog must remain where and how you put him in a stay till you return and give another command or release. The stay command is a little bit more difficult to teach as it is only natural for your dog to want to follow you around, especially when they are a young puppy. You need to take it slow, be patient and at all times be calm. When you say “stay” it should be in a clear, firm, but friendly and gentle tone. To start off, put your dog in a sit position and when your dog is calmly sitting, treat and make sure it know you have more treats in your hand. Take a step backwards and calmly say “stay”. If your dog does not lift his bum off the floor, immediately step towards it and say “good stay”, treat, reward and praise your dog. Do this several times stepping backwards and sideways, ensuring your dog stays in the sitting position. If your dog lifts its bum off the ground, don’t scold it just put your dog in the sit position and try again. Do this several times and finish on a positive note if your dog is getting tired, limit the training time to no more than 10 minutes. Practise it a couple of times a day at least and gradually increase the duration of the stay without walking too far away from your dog..
Once your dog is able to hold the stay for a decent amount of time, steadily increase the distance you walk away from it but remain in the same room, all the while ensuring that your dog stays exactly where you put it. You can praise your dog for staying as you are walking backwards but be sure not to praise if its bum leaves the ground. If this happens just calmly re-start the exercise. Always return back to your dog to release it, rather than calling your dog to you (as this would lead to confusion for the “wait” command). Only reward and treat when your dog has stayed. Once you have mastered this you then need to teach your dog to stay even when there are distractions around. So for this use a favourite toy or treat. Do as before, giving a clear Stay command, take one step back and drop the treat or toy. Your dog will more than likely lift its bum immediately. If it does, just start again, and praise your dog whilst it’s sitting, and crouch down, drop the treat or toy and gently hold your dog back with your hand on its chest, when your dog relaxes, praise and treat. Keep repeating this, gradually increasing your distance away from your dog. Move on to throwing the treat or toy away from your dog, after you have commanded it to stay. At first it may be hard for your dog to resist lunging after it but with patience and perseverance it will get it. When you are comfortable that your dog is obeying the stay command whilst you are in the same room and with distractions you can move onto the next stage, which is to get your dog to stay in the same place even when it can not see you. To do this, make sure you are in a room indoors, give the stay command and walk away, ensuring that your dog maintains the stay position, praising it all the while it is in a stay position, go out the room and round the corner so your dog can’t see you for a split second and return back to it. If your dog stayed, praise/reward and treat. If your dog broke the stay, just calmly start again. Increase this to longer periods of time, remember if your dog breaks the stay, do not scold it. You can use a lively word like “oops” when your dog does something incorrectly during training. Once you have mastered the stay command indoors, you can then start practising in an outside environment. Remember you may feel that your dog knows a command but when it is in a different environment your dog may not respond as well, this is normal. So you have to take it slowly and be patient. From my experience a hand signal is effective for this command. I start to introduce it when I have been able to walk a few paces away from my dog and he has stayed. I put him in a sit, raise my right hand to head height, palm flat facing forward, and a small push of the palm forwards as I say “stay”. I found that my voice makes my dog excited so hand signals seem to work better for me. At a distance I can reinforce the stay without saying anything, therefore he remains more calm and is more likely to succeed.